Description of "Lux 1.1 Seeds (Lux Series) (eBook)"
The Best selling Lux series, available in India for the first time on Pothi.com. 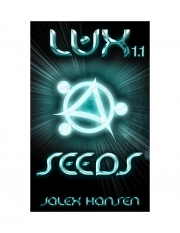 Seeds is the first book in the Lux series. In a crumbling America where teenagers are hunted and contained, a small group of rebels rises up to fight a desperate battle against a power greater than themselves. Lissa isn’t your average seventeen year old to begin with. Raised in a hidden lab, she has been genetically manipulated and given the Lux Marker, an adaptation that allows her to control energy and matter. And she isn’t the only one. Connor has everything a man could want, and he would trade it all in a heartbeat. At least that’s what he thinks until he does just that, giving himself over to the wrong side in return for what he thinks is freedom. Hikari never wanted to be part of the system, but she never expected to be on the run from it, either. When she discovers her congressman father is taking part in a plot to kill innocent people, she pulls a team together from the geek squad at her high school in order to break into his office. However, once they hack into his top secret files, they get way more than they bargained for. Reviews of "Lux 1.1 Seeds (Lux Series) (eBook)"